...why, he would tax the rich! President Barack Obama on Thursday tied his proposal to raise taxes on wealthy Americans to his faith, telling leaders gathered for the National Prayer Breakfast that Jesus’s teachings have shaped that conclusion.The rich should pay more not only because “I actually think that is going to make economic sense, but for me as a Christian, it also coincides with Jesus’s teaching that ‘for unto whom much is given, much shall be required,’” Obama said at the Washington Hilton, delivering remarks at an annual event that every president has attended since Dwight D. Eisenhower.“We can all benefit from turning to our Creator, listening to him,” Obama said. “Avoiding phony religiosity. … This is especially important right now when we’re facing some big challenges as a nation.”Obama infused his remarks on spirituality with a populist message of economic fairness, echoing rhetoric he unveiled in December in Osawatomie, Kan., and returned to in his State of the Union address last week. Without countering his Republican presidential opponents head on, Obama offered a contrast to Mitt Romney’s positions on class and wealth. This is so wrong and such a desperate, pathetic move on Obama's part that I almost don't even know where to begin. Let's keep it simple: the last time I checked, Christ taught charity by choice, not by government edict, which we all know is enforced by gunpoint. In other words, it's not charity if its forced taxation. 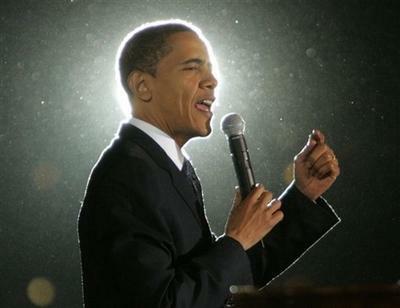 Related thought: Wasn't Obama supposed to be the Messiah? Perhaps he should understand and then cite the Constitution. We are not a theocracy. Not yet anyway. However from all appearances we are indeed headed in that direction, led by the social conservatives, aka the "fundies"